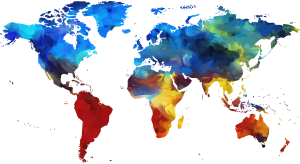 As geography is the study of our earth, the courses offered in this program provide students with a general understanding of all the global realms and their regions. Emphasis is on physical, economic and cultural geography. Currently the program offers two courses, GEO 103 (Geography of the Developing World) and GEO 104 (Geography of the Emerging World). The regions/realms of the course offerings are segregated based on economic geography. GEO 103 highlights countries such as the United States, Japan and Australia who are well developed and GEO 104 focuses on underdeveloped areas. Students learn ways of preservation of the developed countries and identify means of improvement for the areas still under metamorphosis. Acceptance and understanding of all global cultures is stressed. The Geography Program at South Suburban College seeks to expand student understanding of global physical and cultural patterns, along with the implications of change and cultural diversity. Through two courses in developed and developing countries, students will be introduced to contemporary issues and study them from a geographic prospective. Students will be able to use written text, speech, maps and graphics to identify and describe physical, economic and cultural themes of every region on earth. Students are exposed to cultural diversity of the various regions and encouraged to accept the differences other cultures offer. This curriculum is only a suggested transfer program and might not be appropriate for every student. Some four-year institutions accept more than 62 credit hours in transfer to fulfill requirements in geography. Consult the Transfer Center for help in selecting courses appropriate for the program at the college or university where you plan to transfer. Faculty are available during scheduled office hours to advise students about their program and career opportunities. Peruse some of the offerings in the Department of Social and Behavioral Sciences.